A bicrystal is formed by two adjacent crystals separated by a grain boundary. 2 for the orientation of the grain boundary plane defined by its normal \(n\). The rotation between the two crystals is defined by the rotation angle \(\omega\) and the rotation axis common to both crystals \([uvw]\). Disorientation describes the misorientation with the smallest possible rotation angle and \(CS\) denotes one of the symmetry operators for the material . The orientation of a crystal (Euler angles) can be determined via electron backscatter diffraction (EBSD) measurement or via transmission electron microscopy (TEM). The grain boundary plane normal \(n\) can be determined knowing the grain boundary trace angle \(\alpha\) and the grain boundary inclination \(\beta\). 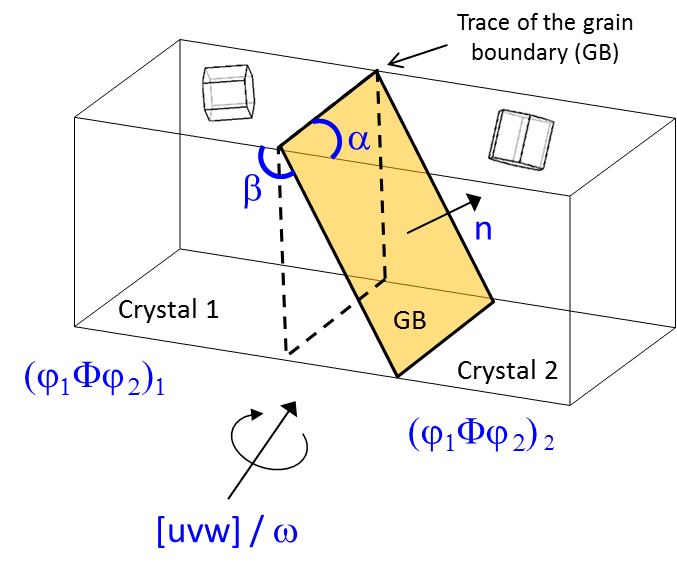 The grain boundary trace angle is obtained through the EBSD measurements (grain boundary endpoints coordinates) and the grain boundary inclination can be assessed by a serial polishing (chemical-mechanical polishing or FIB sectioning), either parallel or perpendicular to the surface of the sample (see Figure 5). Figure 4 Schematic of a bicrystal. 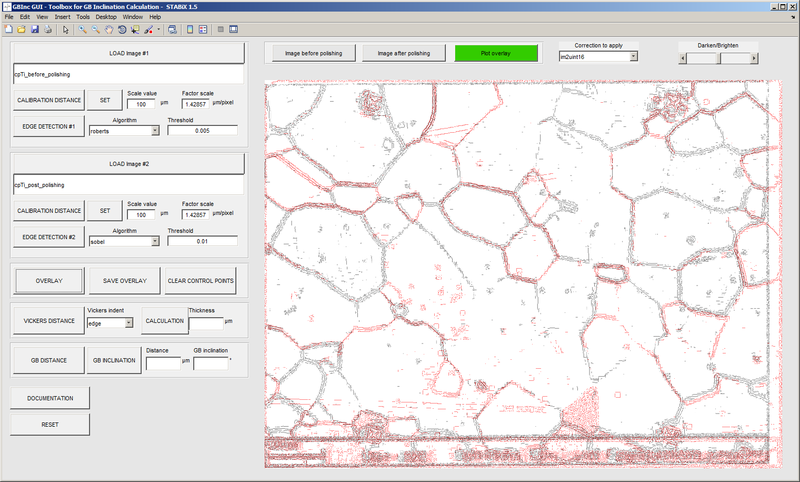 Figure 5 Screenshot of the Matlab GUI used to calculate grain boundary inclination. U.F. Kocks et al., “Texture and Anisotropy: Preferred Orientations in Polycrystals and Their Effect on Materials Properties.” Cambridge University Press (2000). A. Morawiec, “Orientations and Rotations: Computations in Crystallographic Textures.”, Springer, 2004. L. Priester, “Grain Boundaries: From Theory to Engineering.”, Springer Series in Materials Science (2013). V. Randle and O. Engler, “Introduction to Texture Analysis : Macrotexture, Microtexture and Orientation Mapping.”, CRC Press (2000). V. Randle, “A methodology for grain boundary plane assessment by single-section trace analysis.”, Scripta Mater., 2001, 44, pp. 2789-2794. V. Randle, “Five-parameter’ analysis of grain boundary networks by electron backscatter diffraction.”, J. Microscopy, 2005, 222, pp. 69-75. A.P. Sutton and R.W. Balluffi, “Interfaces in Crystalline Materials.”, OUP Oxford (1995).